Yes, I think Teri is going to cry when she sees this. You see, the wife has swapped her Camry with my mother-in-law for her Tucson. It does give us two Tucsons in the household and gives us a choice for our trips (hilly inclines... 6-cylinder, flat area... 4-cylinder.) There are noticeable power drops when taking the 4-cylinder Tucson to L.A. despite the fuel savings. Anyhow, we had to clean up the car yesterday before presenting it to her mom. 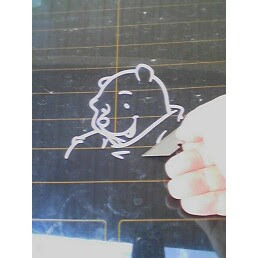 That included the removal of Winnie The Pooh. I really don't know why, but I have never understood the whole Pooh thing. I mean, he's way cute 'n all, but I just never got why he is so popular. With that title, I thought that was going in a different direction. Whew.